If you're all about relaxed dressing when it comes to fashion, you'll love this extra cute combination of a tan wool biker jacket and Dsquared2 jennifer jeans. Opt for a pair of brown suede ankle boots to instantly up the chic factor of any outfit. If you're all about relaxed dressing when it comes to your personal style, you'll love this chic pairing of an olive bomber jacket and Dsquared2 jennifer jeans. When it comes to shoes, this getup is finished off nicely with white and black check slip-on sneakers. Choose a charcoal knit open cardigan and navy ripped skinny jeans, if you want to dress for comfort without looking like you don't care. You could perhaps get a little creative when it comes to footwear and dress up your getup with charcoal suede over the knee boots. 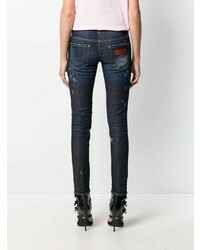 If you're in search of a casual yet stylish getup, opt for a blue denim shirt and Dsquared2 jennifer jeans. Both items are totally comfy and will look fabulous together. Amp up the cool of your ensemble by completing it with beige leather pumps. If you're on a mission for a casual yet totally stylish outfit, consider wearing a light blue dress shirt and Dsquared2 jennifer jeans from farfetch.com. Both pieces are totally comfy and will look fabulous paired together. Up the cool of your outfit by complementing it with tan leopard suede loafers. If you're on a mission for a casual yet totally stylish outfit, consider teaming a beige sleeveless coat with Dsquared2 jennifer jeans. Both pieces are totally comfy and will look fabulous paired together. Up the cool of your getup by wearing black leather pumps. 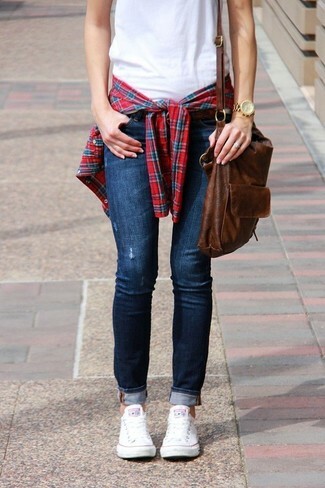 If you're hunting for a casual yet totally stylish outfit, try teaming a red and navy plaid dress shirt with Dsquared2 jennifer jeans. Both pieces are totally comfy and will look fabulous together. To bring out a sassier side of you, complement your ensemble with white low top sneakers. Try teaming a black leather biker jacket with Dsquared2 jennifer jeans for a lazy Sunday brunch. You could perhaps get a little creative when it comes to footwear and lift up your outfit with black leather pumps. If you're a fan of practicality dressing when it comes to your personal style, you'll love this totally chic pairing of a black quilted leather biker jacket and Dsquared2 jennifer jeans. A pair of black leather pumps will add some real flair to this ensemble.